There’s a lot of speculation about what truly is the greatest thing since indoor plumbing. But, for our team at Ray The Plumber, the answer is clear: It’s peace of mind. Even more, we believe these two gifts go hand-in-hand. You see, when your mind is backed up with concern over your plumbing system’s performance, serenity is nowhere to be found—that is, until now. With over four decades of expertise and an extensive line of plumbing services, our team will drain away your worries in a flush—it’s like a flash, but even quicker. 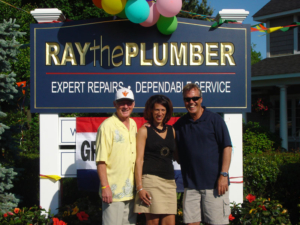 Why Choose Ray The Plumber? The real question is: Why wouldn’t you? You see, our team’s intentions are clear: To drain away your plumbing worries—for good. Because of this, we work tirelessly, delivering fast, reliable, same day service—no matter what. But that’s just scratching the surface. Check out the other reasons why you should choose us here. What factor differentiates a good company from a great one? Its employees. Well, at Ray The Plumber, our team is made up of the most dedicated, knowledgeable and experienced professionals around. In fact, it’s because of our plumbers’ relentless dedication that we guarantee your plumbing is safe in our hands. We’re flushing our way through New York. Explore our service areas here to see if our superior servicing flows in your direction. Everyone needs backup at some point—including us. So, if you have an overflowing passion for the plumbing industry, check out our current employment opportunities. It’s no longer our little secret. Our customers are spilling the details about our quality work.